Above is my exchange I sent out to Kim M. through the HOE blog for the Halloween exchange. It is Prarie Schooler from the Trick or Treat chart. I love this little ornament. You may remember I stitched the bigger design off of the chart for myself, and in the bigger version the cat has on a little skeleton costume. And looking back at my blog I don't think I ever posted a picture of that finish, i'll have to remember to do that next week, I loved this design. And this is what I recieved from the Halloween exchange from Becky. 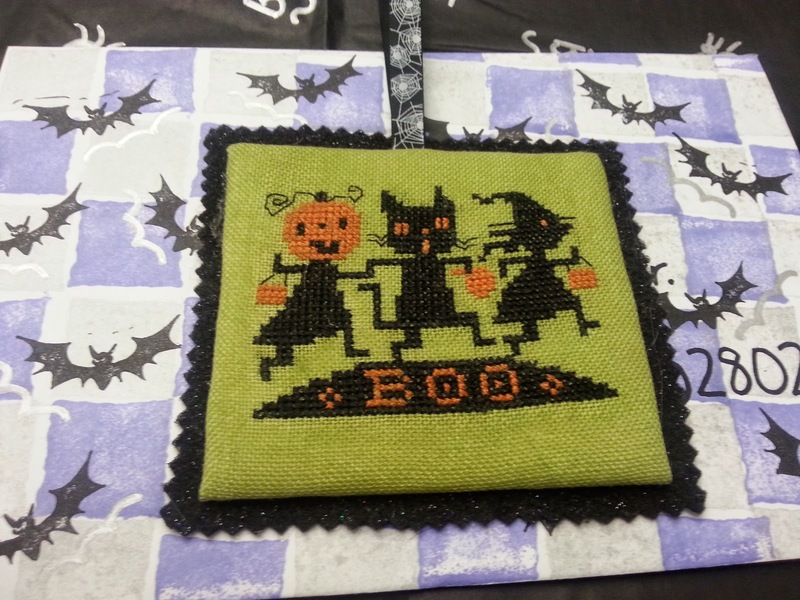 It is a Nicole Farrauto "Petite Halloween Sampler" from the JCS Halloween 2014 issue. I love the black cat in the pumpkin patch! And my own little Christmas ornament from JCS, by Ink Circles. Coming along but slowly. We are still moving houses this week. This weekend we moved 10 truckfulls of stuff from one house to the other. It was a lot of hard work, and I am so sore today. My back and arms are killing me! It is so exciting seeing everything come together in the new house, Also overwhelming though the amount of stuff we still have to move! This week is our official move week, we should get the keys to our new house Wednesday or Thursday. I normally go all out decorating for Fall/Autumn but this year with everything still in boxes none of my fall stitches got to see the light of day. Fall is definately my favorite time of year so I am hoping to at least be unpacked enough so I don't miss my favorite holiday Halloween. 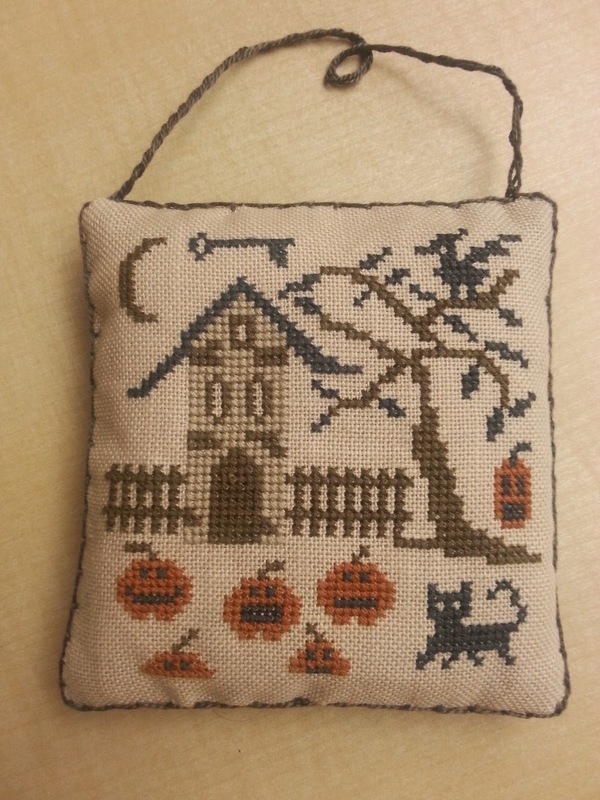 Yes, yes I have seperate decorations/stitching for Autumn vs. Halloween--their not the same to me and I love both of them! Above is my progress on Ink Circle's "Stained Glass Holly", For an ornament this one has been slow going. The black took me a long time to do, so I am hoping filling in the colors now will go quicker. And here is Santa again. 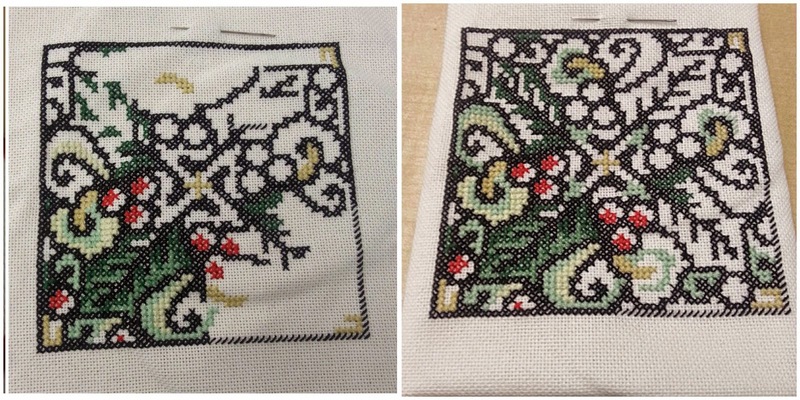 Still stitching, and stitching and then there will be beading and by that time I may be very very old.....no just kidding, I only started this one this year, but it feels like it is taking forever. Solid stitching and lots of colors, but a beautiful design none the less. 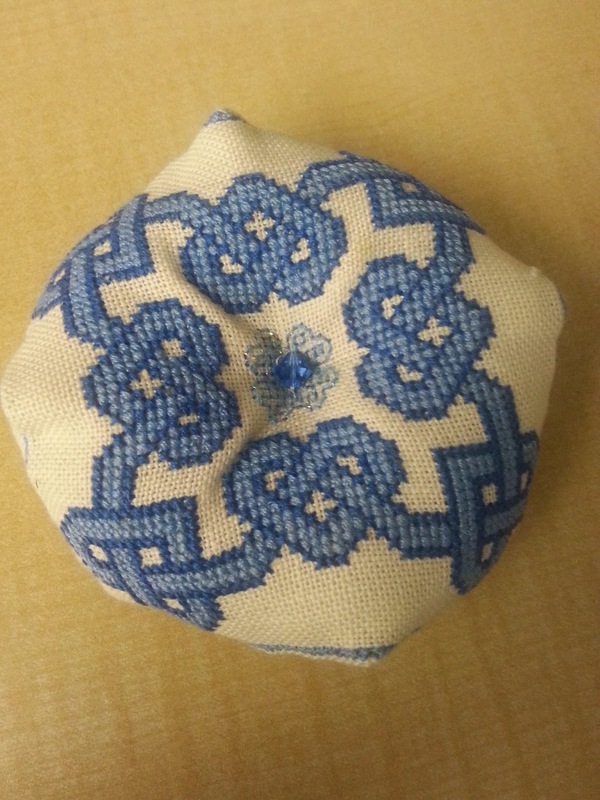 I am just an impatient stitcher. I apparently am in no mood for fall this year. 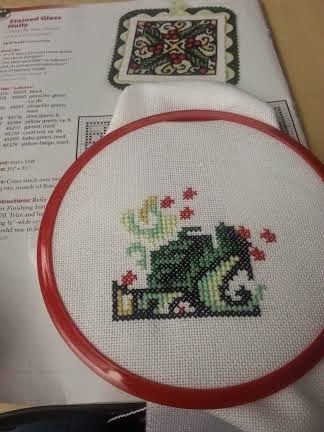 I managed to get my Prairie Schooler Autumn peice about 75% done before I got distracted by Christmas. 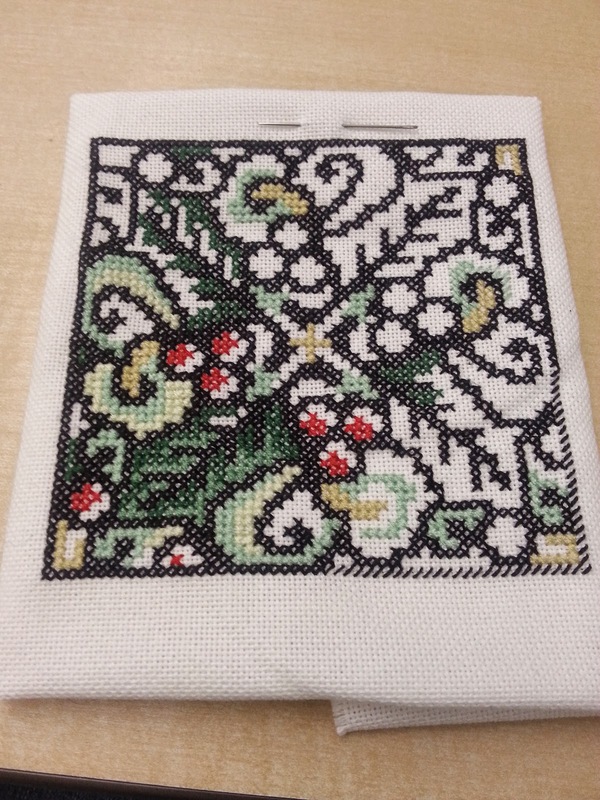 So it was on to this lovely little ornament, "Stained Glass Holly" by Ink circle designs. 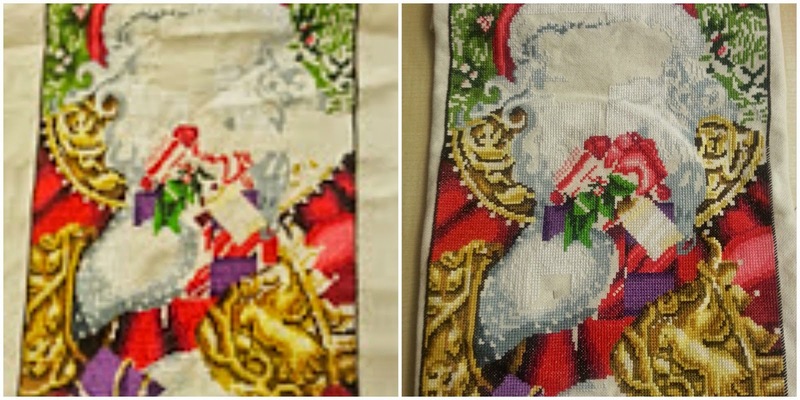 Apparently the large Santa peice i've been working on all year is not enough Christmas for me. 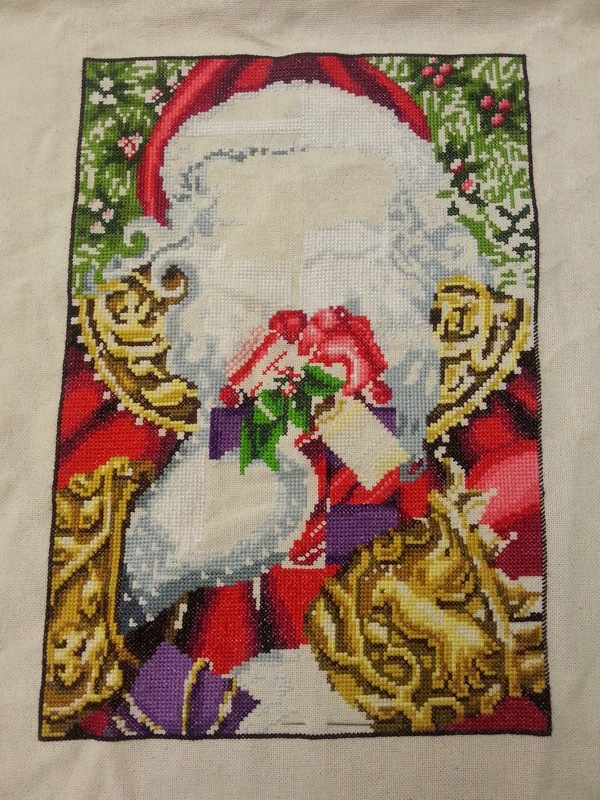 Progress on Mirabilia Santa is slow now, because it is a lot of confetti stitching and filling in. Blech! This was a pretty biscornu I received from Kim through the HOE blog. She angel stitched it for me, and I love it. Blue is my favorite color so it was just a perfect choice. 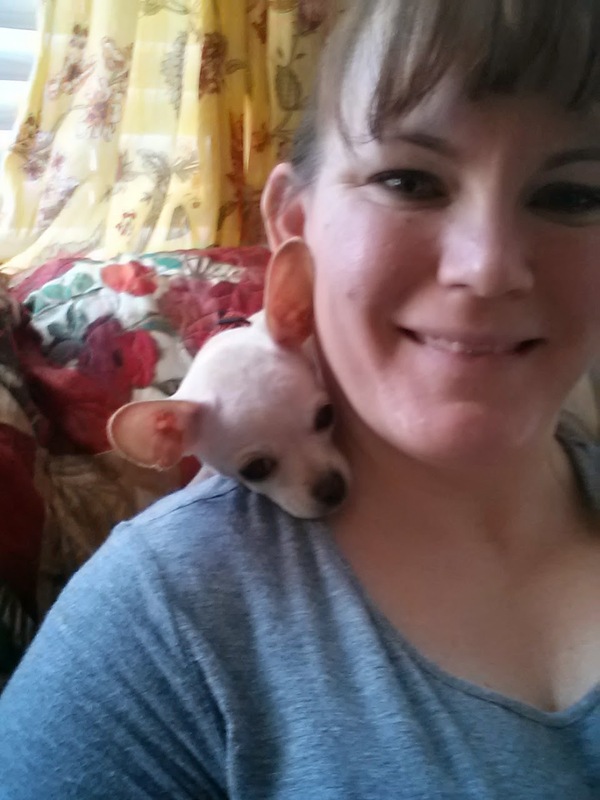 Here is me with our current foster dog Miss "Lil bits". She goes back tomorrow to the shelter to find her forever family. I know she will be adopted quickly as she is just a pup, and so tiny and so cute. She likes to snuggle on the couch behind my neck while I stitch/watch tv. It is so hard every time to give them back though, I always feel a little sad. We have fostered 10 dogs so far through a local rescue and through the Humane society, and every single one of them we loved. The only thing that makes it better is knowing there is another dog out there we can help. I feel like a lot of my life is in transition this month. We are in the process of buying a new house, which will be great for our family, but I love the house we are moving from. It is just too small for our family (1 bathroom for 5 people just doesn't cut it!). I have owned this house for ten years now and feel like our family has grown up in it. Now all of our stuff is in boxes and we have been painting/cleaning/prepping the house to move out of it. I feel a little unsettled by all of it though, excited but unsettled.